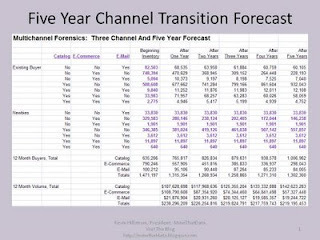 Half of my Multichannel Forensics projects focus on measuring the future trajectory of one channel. We try to understand when "the channel is likely to change in stature". Channel transition happens years before the channel actually transforms itself. Three conditions need to be satisfied to declare a transformational condition. The traditional channel is experiencing a decrease in the number of new customers, a trend that has happened over multiple years. The traditional channel is in "equilibrium mode" with the emerging channel. This is a classic "slow leak" situation. Seldom does the traditional channel go into "transfer mode" with the emerging channel. The emerging channel is in "isolation mode" with the traditional channel. In other words, customers utilizing the emerging channel do not go back to the traditional channel. We focus a lot of effort on major channels, but the real secrets exist across an array of micro-channels that facilitate channel transition. In the newspaper industry, channel transition began a long time ago. An inability to monetize emerging channels coupled with reductions in advertising revenue in traditional channels fueled the death of the traditional channel. In the music industry, an intermediate micro-channel (ripping CDs) slowed channel death. For a period of time, CDs remained relevant, as long as customers purchased CDs and ripped songs into the MP3 format. Once this intermediate micro-channel was replaced, death of the traditional channel became apparent. E-Mail marketers are going through this transition. People are using Facebook and Twitter in ways they would have used e-mail five years ago. You read the articles in the e-mail marketing community, articles where they talk about combining e-mail marketing and social media, and you now hear the same arguments that came from the catalog community five years ago when e-mail marketers and online marketers mocked catalog marketers. And if you're a big fan of Google, well, you're watching the early stages of channel transition. Look at how this individual is able to modify Google results with a Twitter app (I also use this app). Twitter and Google become a micro-channel, in combination. The Web 1.0 community, the very folks who mocked the catalog industry and newspaper industry, are entering their own transitions. So again, we use Multichannel Forensics to understand when customers are making the transition from one channel to another channel. Your Google/ Twitter app raises an interesting point - Mashups. From Wikipedia "a mashup is a Web application that combines data from one or more sources into a single integrated tool." Now this blurs the definition of/ distinction between channels doesn't it? In my Multichannel Forensics projects, if the data is available, then the mashup, if you will, becomes a micro-channel. The key is to see what a customer who uses a mashup does next.